For information about area hot springs, the Jemez Bath House or Village actitivites please visit the official website for the Village of Jemez Springs. Your choices for local day trips or outings are numerous. 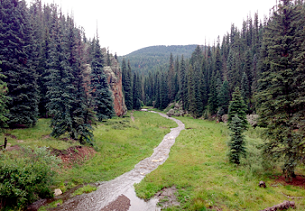 You'll find hiking, fishing, bird and wildlife watching and much more in the surrounding Jemez valley. Close by are archeological ruins, Indian pueblos, galleries, places to eat and shop, including Ponderosa Valley Vineyards & Winery. 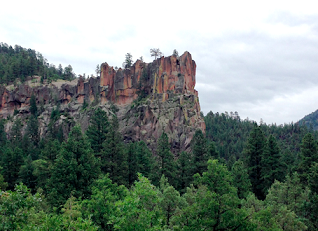 Take a driving tour through the area to see many cultural and geological wonders, such as the Jemez State Monument, preserving the ruins of a 17th century Spanish mission and 13th century Indian pueblo. Past volcanic activity has created many natural hot springs, sulfurous vents and the caldera in the nearby Valle Grande. After a long hike or a day on the slopes, you may indulge yourself in a massage and a soak at our local Jemez Springs Bath House fed by natural hot springs. Or enjoy an outdoor soak at the Giggling Springs Hot Spring in downtown Jemez Springs. Be sure to visit Soda Dam where the river drops 15 feet through an interesting formation of mineral deposits from nearby thermal springs. 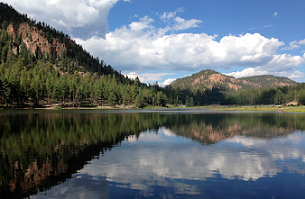 A short drive away is Fenton lake where fishing and canoing can be done. Also is Bandelier National Monument, which has some of the best examples of pueblo cliff dwellings you'll find (allow a whole day). In less than an hour you can drive to Los Alamos with the famous Los Alamos National Laboratory to explore the town with the highest number of Phd's per capita of any city in the US. During winter in the same area is Pajarito Mountain Ski Area for skiing and snowboarding. Or travel to Albuquerque where the museums, amusement parks, restaurants and movies will give you every convenience of a big city. A cultural experience awaits you in Santa Fe, with pueblo architecture, the Santa Fe Opera and many excellent art galleries, museums, shops and restaurants. Not much further is Taos, famous for its skiing and art galleries. Christ in the Desert Monastery is a fascinating and beautiful place; near the homeland of Georgia O'Keefe in northern New Mexico. including things to do and places to see.